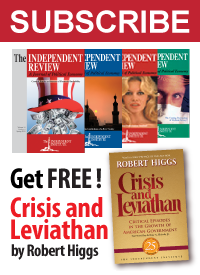 The Congressional Budget Office (CBO) has issued its Long-Term Budget Outlook for 2014. Compared to previous reports, it projects a slightly worse outlook for the nation’s fiscal situation, which results from the CBO’s new assessment that the U.S. economy’s potential for stronger economic growth in the future is lacking. 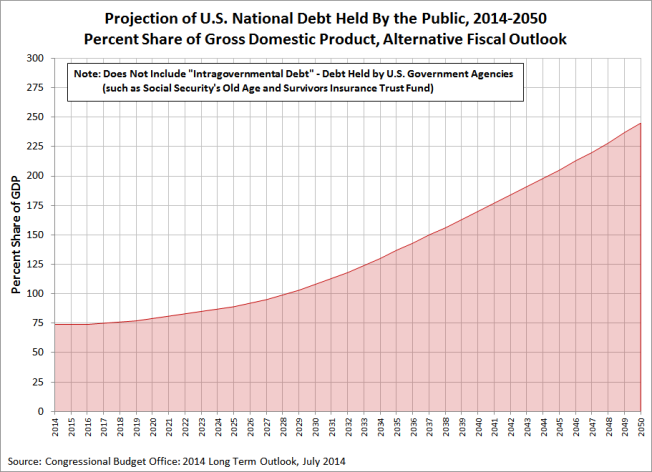 … the worsening debt-to-GDP ratio is not due to greater debt accumulation, according to the CBO. Instead, it’s a function of slower anticipated economic growth. The CBO had previously downgraded its estimates of economic growth to reflect the economy’s weak performance in recent years and its projections for slower labor force and productivity growth. The chart below shows how the national debt held by the public, which does not include the debt held by government entities (such as Social Security’s trust fund), is expected to change as part of the CBO’s alternative fiscal scenario. The CBO projects this value only up through 2050, because after that point, the portion of the U.S. national debt held by the public will exceed 250% of GDP and the CBO is not confident of its ability to forecast GDP in that kind of economic environment. The CBO lacks confidence in its ability to anticipate how much productive economic activity would be “crowded out” by the kind of chronic budget deficits that the U.S. federal government would be running at that point. Although they expect that the growth rate of GDP would be progressively forced lower over time as a result, they do not know by how much. Congressional Budget Office. The 2014 Long-Term Budget Outlook. [PDF Document]. Data and Technical Information [Excel Spreadsheet]. 15 July 2014.